Purpose: read data from any analogue sensor using RFDuino, display that data on iPhone. Communicaton is by bluetooth. The iPhone app allows the user to set the minimum and maximum sensor values and the minimum and maximum scale values. For example, suppose that the minimum and maximum sensor value are set to 0 and 760, and the minimum and maximum scale values are set to 0 and 100, the a sensor reading of 380 will be displayed as a scale reading of 50. (See note on scale calibration below). The rightmost blue button, with text “Normal” or “Reversed” is used to toggle the scale direction. For example, in normal mode, 760 gives a scale reading of 100, while in reversed mode, it gives a scale reading of 0. 1. The rfduino board (see http://www.rfduino.com) connected to an analogue sensor circut and to a power supply — five volts is best, but 3v works and so should 1.5v, although I have not tested that. The basic circuit: GPIO pin 1 to sensor to resistor to GND. 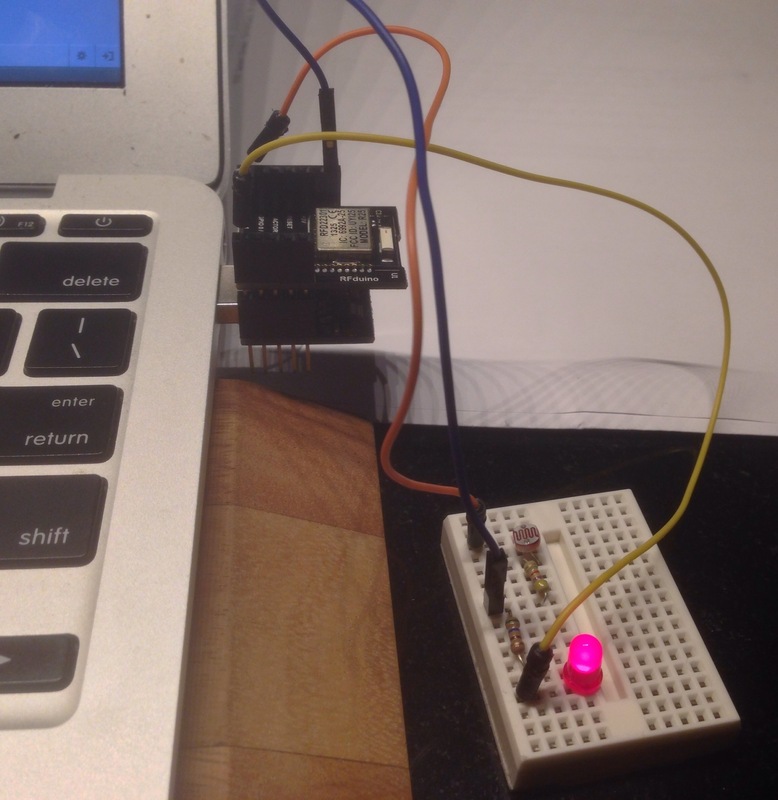 Optional: GPIO pin 2 to LED to resistor to GND — blinks to show that circuit is operational. Note that when using a light sensor at low light levels, the blinking LED affects the light readings. 2. A arduino sketch (Folder = Sensor_RFDuino) that you upload to the RFDuino. 3. 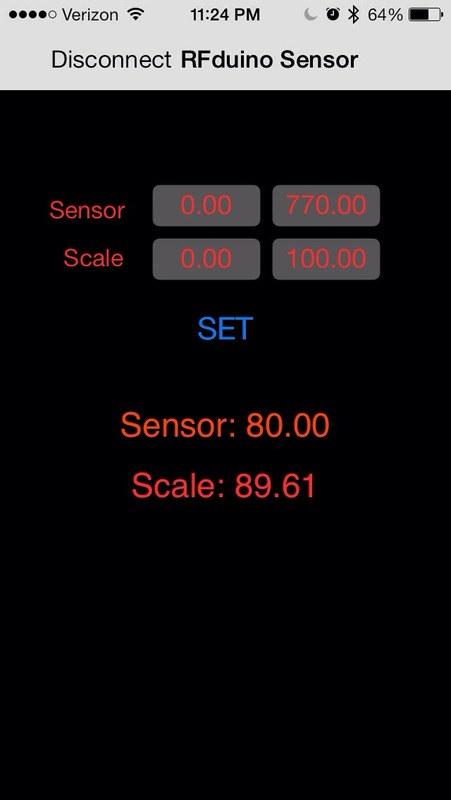 An iPhone app that displays the sensor data. Communication with the rfduino is by Bluetooth. Scale calibration. I used a cadmium sulfide photoresistor for this project with a 9.7 KOhm resistor. The circuit was GPIO pin 1 on RFDuino to photoresistor to resistor to GND. To calibrate, I first removed the photoresistor. This gave me the maximum sensor reading of 748. Then I attached a jumper to the pins where the photoresistor normally goes to short this part of the circuit. This gave me a minimum sensor reading of 66. I entered these values into the two “Sensor” fields on the app and pressed “Set”. Next, I set the scale mode to “Reversed”. This was so that bright light would read high on the scale, low light low. NOTES: (1) at the moment, you need to put the folders containing the iphone code in the folder RFDuino/iPhone\ Apps so that it will see the rfduino library — RFDuino.h, etc. I will remedy this at a later date. For now, see https://github.com/RFduino/RFduino for the code needed. (2) The code for this project is derived from Arduino sketch and iPhone code for the rfduinoTemperature project at https://github.com/RFduino/RFduino. Compositium 3 consists of four superimposed copies of an image representing two plumes created by Brownian motion. The copies have been translated, flipped, and arranged to counterbalance the irregularity of the plumes with a degree of symmetry and also to fill the canvas. The original Brownian motion image was made with a new version of Kaleidoscope, an iphone app for running simulations and procedural art animations. This version features a drop-in architecture by means of which different dynamical systems can be dropped into the app with no changes to the rendering engine.